There’s nothing more enjoyable then sitting in your car waiting for it to defrost in –30 C weather with the heat blasting in your face. Am I right? Your eyes start to burn and feel like fire. You park your car and everything takes a drastic turn because your eyes start weeping once you step foot outside your car. What is going on with my eyes?? In the winter everything becomes awfully dry and our eyes unfortunately feel the brunt of it all. Let’s break it down. When you’re sitting in the car with the heaters facing you, the hot air is stripping the tears right off the front of your eyes. Once the tears are stripped your eyes feel hot and sometimes even burn. On the flipside when you’re outside your eyes start tearing because your eyes are trying to maintain a healthy balance but instead your eyes overproduce tears. What can you do to survive the winter? There are a couple little tips and tricks that can help you maintain a healthier and more comfortable eye. Now not all artificial tears are made the same. Certain formulations are better than others. It can get very overwhelming in the aisles of your pharmacy. Luckily at MVC we have curated our favorite products for you to purchase and use. PS – Did you know we also sell them online? We love preservative free drops. Why? It gives you the freedom to use them as often as you like without worrying about any interactions with the preservatives. Our Hylo drops and Thealoz drops are preservative free and also come in a multi-dose bottle so you don’t have to toss out the bottle every time you use it! Win! Artificial tears are a way to substitute what your eyes may be lacking. 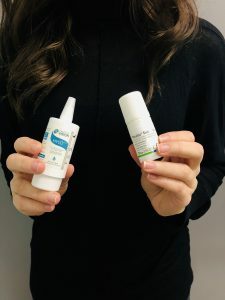 Whether it is a lack of mucous, oil or water, eye drops can supply the eye with what it needs to maintain a healthy balance. If you’re not sure what your eyes are lacking, our optometrists can perform a dry eye analysis to select the best product for you! Our eyelids also need a little bit of TLC too. Warm compresses may not seem like a ground breaking technology, but the heat and moisture does a lot for the eyes. When the glands of our eyelids are heated to an optimal temperature, oils are expressed and help keep the tears in place! At MVC we sell the Bruder mask and it’s wonderful because it heats up easily in the microwave and provides warm moist heat for the eyelids! If you are ready to hydrate those eyes in this bone-dry frigid winter then come on by! If you’re not sure what product is for you, our helpful staff can give you a hand. Everyone’s eyes are different so if you haven’t had an eye exam then go ahead and book one online. Your eyes will thank you! Stay warm.